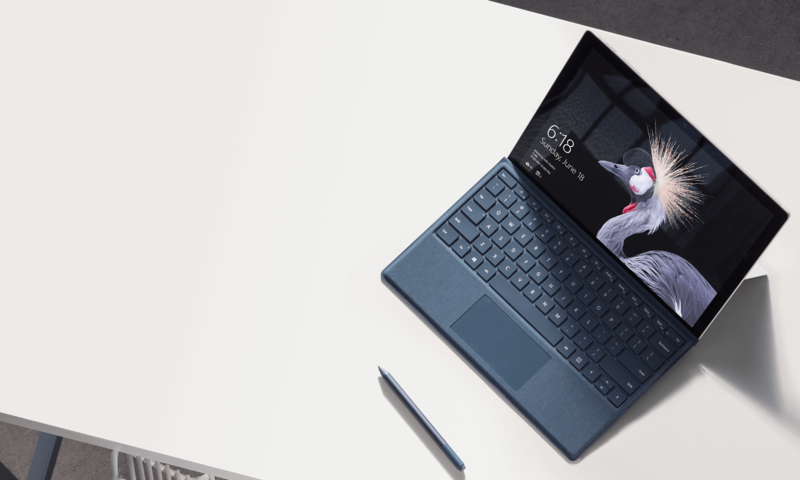 Create, study, work and play with the Microsoft Surface Pro — now better than ever! With the versatility of laptop, studio and tablet modes, it allows you to quickly and easily design works of art, take notes, schedule appointments, and stream Full HD Plus videos. Runs on Microsoft Windows 10 Pro. Powered by a 7th Generation Intel Core i5 processor for all the speed you need. Features a 12.3" Full HD PixelSense™ Display touchscreen. Easily runs desktop software and touch apps. Full HD Plus resolution (2736 x 1824) for ultra-clear, crisp viewing. 8GB of memory is available to run you programs. Memory is not expandable. 256GB solid state drive stores all your apps, games, videos and documents. Easily stay connected on your Microsoft Surface Pro tablet with Wireless-AC and Bluetooth® 4.0. Ports included: USB 3.0, microSD slot, mini DisplayPort, 3.5mm audio port. Dual HD cameras, 5MP front and 8MP auto-focus back. Also features integrated front and rear facing microphones and built-in stereo speakers. Keyboard is also sold separately. Stays powered for up to 13.5 hours. Battery life will vary depending on the product configuration, product model, applications loaded on the product, power-management setting of the product, and the product features used by the customer. As with all batteries, the maximum capacity of this battery will decrease with time and usage. Better than ever, the new Surface Pro gives you a best-in-class laptop, plus the versatility of a studio and tablet. The stunning PixelSense™ Display supports Pen* and touch, while the refined design provides 50% more battery life than Surface Pro 4 and 2.5x more performance than Surface Pro 3. Lower the Kickstand — now featuring a deeper, next-generation hinge — to place Surface Pro in Studio Mode for the perfect writing and drawing angle. Create, study, work, and play virtually anywhere. Better than ever, ultra-light Surface Pro gives you total mobile productivity, all-day battery life,1 plus a softer, ultra-portable design with rounded edges. Surface Pro delivers even more speed and performance thanks to a powerful Intel® Core™ processor — plus up to 50% longer battery life1 than Surface Pro 4, 2.5x more performance than Surface Pro 3, and the fastest startup and resume of any Surface Pro yet. The best of Microsoft at your fingertips. It’s easy to sync your phone’s photos, music, videos, and files with your Surface when you use OneDrive.8 Transition seamlessly between your phone and your Surface when working in Word, Excel, or PowerPoint – Microsoft Office10 works great on iOS and Android, syncing your work across all your devices. And your email and calendar are always up-to-date with Outlook. Even Microsoft Edge is available9 on iOS and Android phones11 so you can sync favorites and passwords, and browse continuously from your phone to your Surface and back again. ** Type Cover sold separately. 1 Up to 13.5 hours of video playback. Testing conducted by Microsoft in April 2017 using preproduction Intel Core i5, 256GB, 8 GB RAM device. Testing consisted of full battery discharge during video playback. All settings were default except: Wi-Fi was associated with a network and Auto-Brightness disabled. Battery life varies significantly with settings, usage, and other factors. 2 Available colors vary in some markets. 3 Surface Pen tilt functionality is available now with Surface Pro. Available with other Surface devices via Windows Update. 4 System software uses significant storage space. Available storage is subject to change based on system software updates and apps usage. 1GB = 1 billion bytes. See surface.com/storage for more details. 5 Up to 13.5 hours of video playback. Testing conducted by Microsoft in April 2017 using preproduction Intel® Core™ i5, 256GB, 8 GB RAM devices. Testing consisted of full battery discharge during video playback. All settings were default except: Wi-Fi was associated with a network and Auto-Brightness disabled. Battery life varies significantly with settings, usage, and other factors. 6 Up to 14.5 hours of video playback. Testing conducted by Microsoft in April 2017 using preproduction Intel® Core™ i5, 256GB, 8 GB RAM device. Testing consisted of full battery discharge during video playback. All settings were default except: Wi-Fi was associated with a network. Battery life varies significantly with settings, usage, and other factors. 7 Up to 17 hours of video playback. Testing conducted by Microsoft in October 2017 using preproduction Intel® Core™ i7, 1TB, 16 GB RAM device. Testing consisted of full battery discharge during video playback. All settings were default except: Wi-Fi was associated with a network and Auto-Brightness disabled. Battery life varies significantly with settings, usage, and other factors. 8 Phones and apps may use Wifi and/or cellular to sync; check the settings on your phone’s apps to specify your preferred method to sync (data charges may apply). 9 Some apps may not be available in all markets. 10 Users must download the Microsoft Edge and Office apps to iOS and Android phones and follow setup prompts. Mobile phone must be linked to the PC in PC settings. Users must purchase an Office license or Office 365 subscription. 11 Requires Android version 4.4 or higher or iOS 10 or higher. Availability and support may vary by device and regions.